The Sewcialists have declared July lingerie sewing month and I’m more than happy to participate. 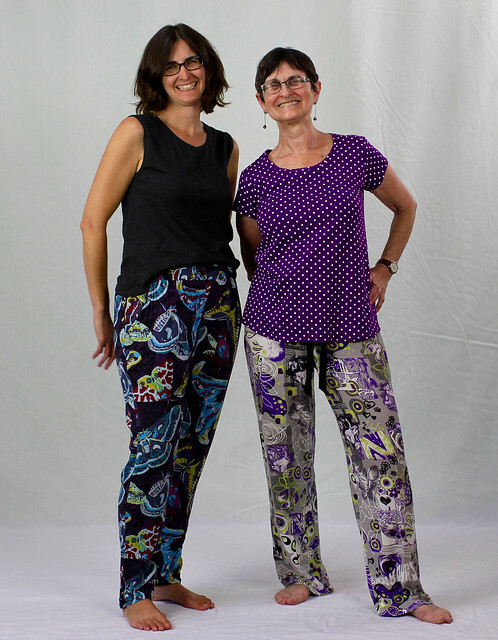 I’ve been busy making pajamas and loungewear for several months now. Despite this I haven’t managed a single blog picture! So I enlisted the help of my Mom (who has also been sewing up PJs like crazy) to document all of our pajama sewing. Up first… I’m wearing True Bias Hudson pants and a knit Scout tee. My Hudsons are in a poly sweater knit. For this version I stuck close to the pattern. Love it! Mom is also in a Scout tee and her bottoms are Butterick B5829 View E. This is her perfect combo so all of her sets are B5829 and Scout. These are in a rayon jersey. Mom is in True Camo cotton knit featuring a wheat print. These prints are kind of a cross between nature photography and camo, aren’t they? Anyway, they make awesome pajamas! I’m in another pair of Hudsons – this time in a cotton terry. I left out the drawstring but otherwise stuck with the pattern. Paired with my favorite Plantain muscle tee. I’m in another pair of Hudsons but this time I mixed it up with a rayon. I used the woven variation that Kelly posted. The fabric is Anna Maria Horner’s Sinister Swarm. The first time I saw this fabric I thought “must be pajamas…” Mom’s are a rayon knit. And I think we both scored our fabric on sale from Stonemountain. Our final pairs. Mom is sporting Anna Maria Horner now. And this time my Hudsons are a size smaller and made without cuffs or drawstring. Recognize the fabric? Same sweater knit as the contrast color in the first pair. And worn with a Plantain tee. So what can we conclude from our pajama party? First, it’s great to sew your own lounge wear. Obviously don’t be shy about prints or colors. 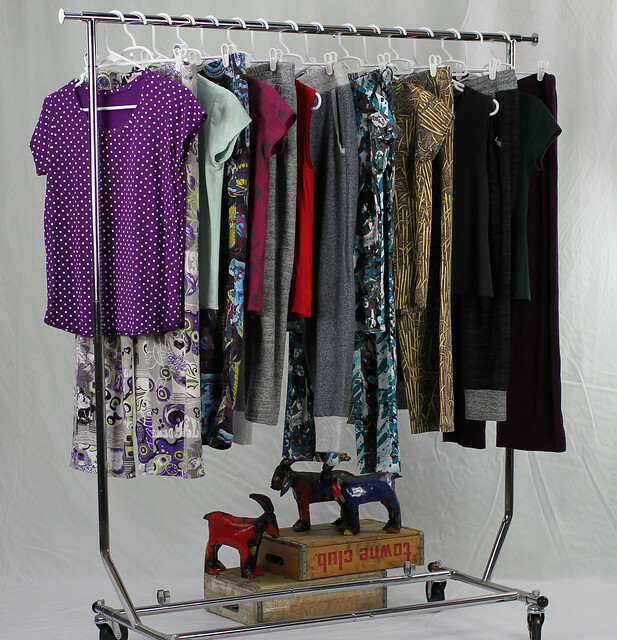 And once you find your perfect pajama pattern you may not want to stray! What about you? Do you make your own pajamas? What an awesome collection of pyjamas!!! As it happens, I just took a bunch of PJ pics with my mom, too – except she the photographer! 🙂 You’ve both done so well to get the most of out a few patterns with lots of fun fabrics! That’s hilarious… What do sewers do in July? 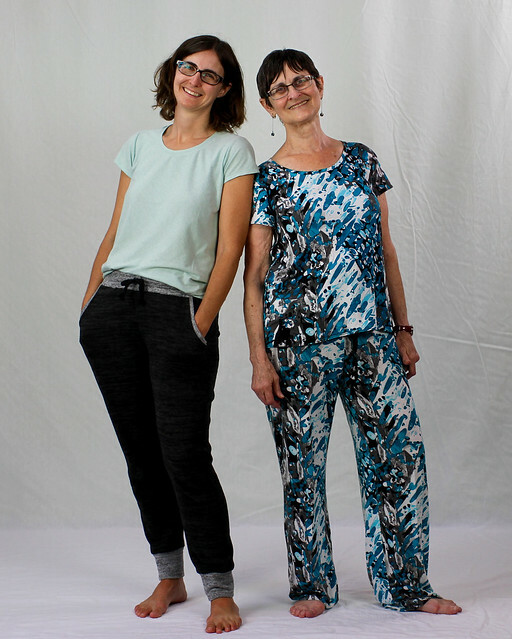 Take pictures of pajamas with their moms – duh! Can’t wait to see those pics – I’m sure you have great PJs. Happy to participate & thanks for including us! Wow, so many beautiful pj’s, I am really impressed. I’m always sleeping in old shirts and I now need to make me some real lounge wear. Thanks for the inspiration you two! That’s exactly what I used to wear! So worth it to make lounge wear you love. Good luck & can’t wait to see what you make! Oh, wow, that is a lot of awesome right there! You’re set for all the lounging! I have the Hudson pattern and the Scout pattern, must. go. make. PJs.!!! These PJs are so cute and comfy-looking! And you guys look like you’re having so much fun in the photos- yay! Hahahah, both of you are so crazy! Thank you! This is the first time we’ve hung out in our pajamas together in… decades?! What a great collection! And the best part, what beautiful pics with your mom – ones to cherish! Thanks Elise. You’re right. 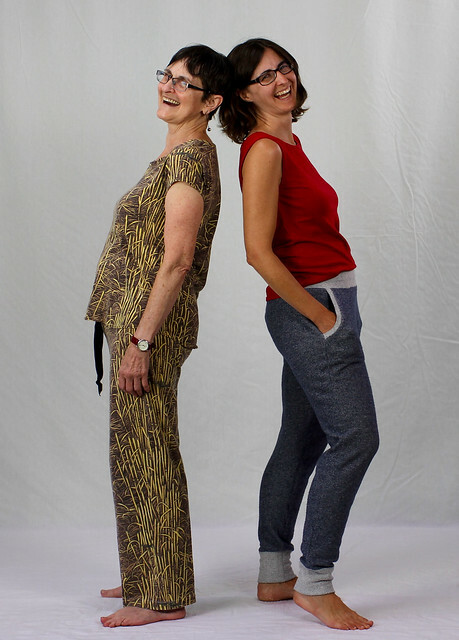 It’s so fun to do a photo shoot with my mom & the pictures are a great reminder! 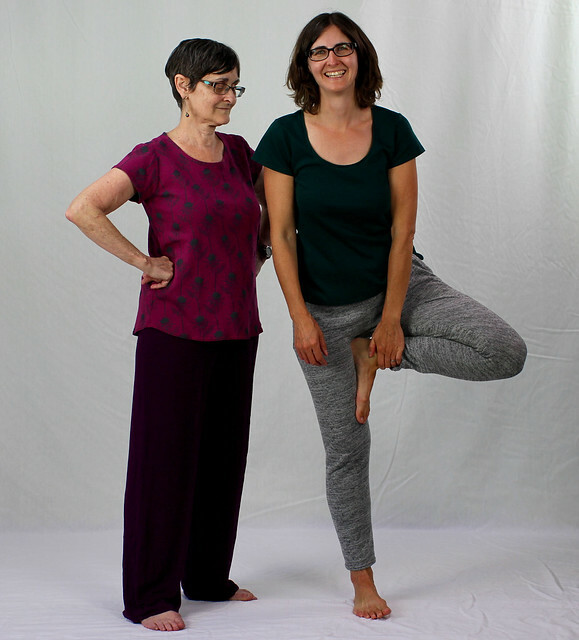 Love the mom and daughter photo shoot!